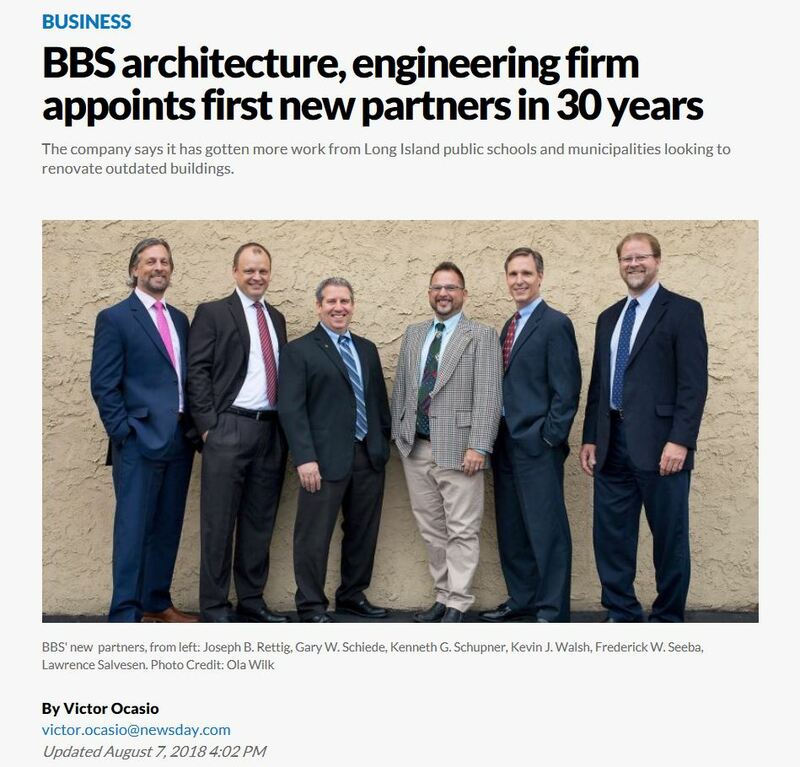 Patchogue-based BBS Architects, Landscape Architects and Engineers, a firm founded in the 1970s, has appointed new partners for the first time in more than 30 years. BBS, which primarily does design and engineering work for Long Island’s K-12 public schools and higher education institutions, has brought on six partners as part of a corporate succession plan, the company said. The partners include longtime architects and engineers at the firm. The company, which has 73 employees, opened its second office earlier this year in Albany, in hopes of recruiting engineers and architects upstate while expanding statewide. Over the past 20 years, the company has done design and engineering work worth $3 billion on school construction projects. BBS, which had revenue of more than $11 million last year, has gotten work from public schools and municipalities looking to renovate outdated buildings. Ongoing design projects for the firm include a new business incubator adjacent to Bush-Brown Hall at Long Island University in Brookville, capital improvements for the Comsewogue school district, and the planned 134,000-square-foot Wellbridge Residential Substance-Abuse Treatment Campus in Calverton. The other new partners include Kevin J. Walsh, Lawrence Salvesen, Kenneth G. Schupner, Joseph B. Rettig and Gary W. Schiede.